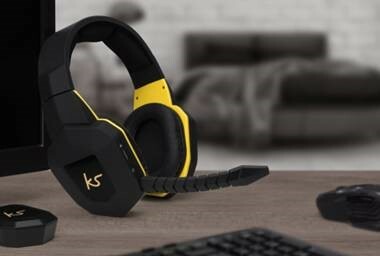 KitSound introduces the new Storm Gaming Headphones, featuring wireless connectivity, 40 mm drivers and delicate tuning to ensure that no sound is lost as well as, a detachable microphone and multi platform compatibility. The new Storm Gaming Headphones will make you experience your gaming in a totally fresh way. Purposefully designed for multi-compatibility, the Storm engages with Xbox, Playstation, and PC. The 2.4 GHz transmission connectivity provides a wire-free alternative that will offer you clear sound with the minimum of lag. Now you can decide whether you want to play alone or team up with others thanks to the detachable microphone that comes with each Storm. With up to seven hours of battery life, your Storm Gaming Headphones give you the chance to bring the storm to your opponents hour after hour. KitSound products are available in most high street and online retailers.